Sometimes, you have to wonder whether some form of divine intervention has occurred for the Brewers. Shaun Marcum gets the starting nod tonight against the Nationals. He could just as easily be starting for the Dodgers right now. The Brewers placed him on waivers just before the trade deadline in late August. Having pitched in only one game since returning from the disabled list on August 25 from an elbow injury, Marcum didn’t have any suitable takers. That could be a blessing in disguise. With the Brewers now just two games out of the wild card, the rotation looks nothing like it did in spring training. Ace Zack Greinke has departed for Los Angeles, Randy Wolf was released for ineffectiveness, and Chris Narveson was lost for the season early on. Anchored by Yovani Gallardo, the rotation now features rookies Wily Peralta and Michael Fiers, as well as swingman Marco Estrada. If the team has serious playoff aspirations, Marcum will be a key part of it – maybe the key. When healthy, Marcum is as reliable as they come. Last year, he pitched at least six innings in twenty-five starts. Over 200 innings, he compiled a 3.54 era, striking out over 8 batters per 9. There is consistency here to hang your hat on. Unfortunately, that isn’t what most are going to remember about Marcum’s dominant 2011 season. The wheels came off in the postseason, where Marcum lost each start and gave up 16 runs over 9.2 innings. He started the final game of the NLCS, putting the Brewers in a 4-run hole before he departed. The Brewers will have to hope Marcum has put the puzzle pieces together. Because of his injury, Marcum has logged just over 100 innings this year, about half the load he put on it during 2011. That should help keep him fresh for the stretch. Even though Marcum has caught a lot of flack for his injury history, that just might push the Brewers into the playoffs. 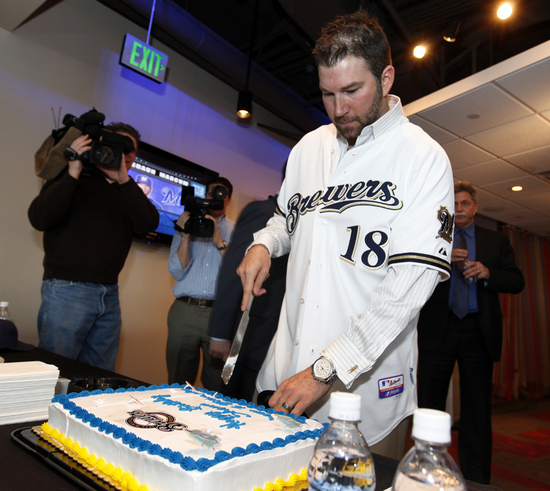 This entry was posted in News and tagged 2012 Postseason, Milwaukee Brewers, Shaun Marcum. Bookmark the permalink.